The first recipe I ever tried from Jenny was peanut butter pie. Her husband had passed away and she was trying to find ways to honor his memory. So we made peanut butter pie. His favorite. I've followed Jenny's journey through the past few years and I admire her resilience, tenacity, and willingness to share her personal struggles. I also love her writing style. One day, when her daughters are older, I believe they will treasure the love she has so beautifully penned through the trials and transitions in their lives after the death of their father. Scones have been a hot topic among my foodie co-workers lately. Kerry and Elizabeth have both been gushing over a recipe for whole wheat ricotta scones shared from Smitten Kitchen several years ago. 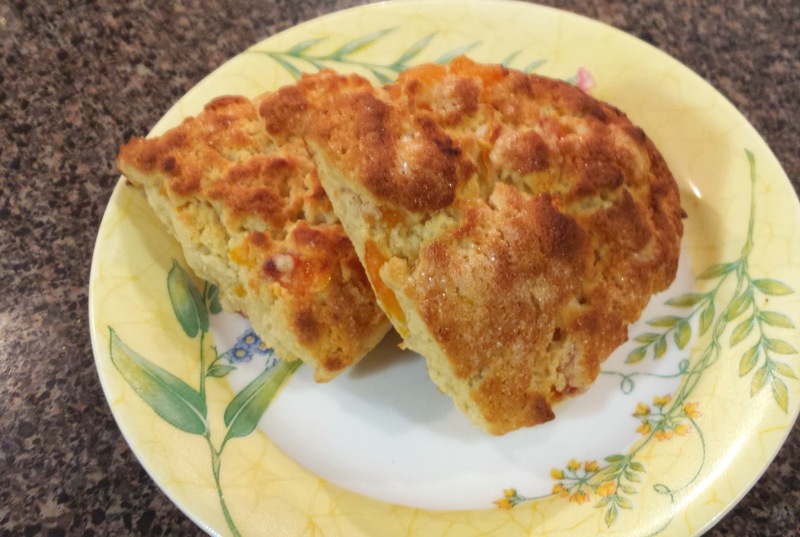 So when Jenny shared a small batch recipe for peach scones last week, I really wanted to try them. I love that the recipe is for a small batch. There are only two humans in our immediate family (yep, the furrbabies are absolutely family)... and Michael isn't a huge baked goods fan (unless it's chocolate cake, brownies, or his favorite chocolate chip cookies!)... so when I find a small batch recipe, it's a great option for us! Peaches are in season right now and I just happened to find a few perfectly ripe ones at the grocery store this morning. I made Jenny's recipe with a few basic adjustments to what I had on hand... and of course, made gluten-free. Preheat the oven to 425 degrees. Place the peach cubes in a small baking dish and sprinkle with 1 tablespoon of sugar. Roast the peaches for 10 minutes until they are fragrant and a bit jammy. In a medium bowl whisk together 1/4 cup sugar, the gluten-free flour, baking powder, and salt. Cut the butter into the dry ingredients with a fork or a pastry/dough blender. In a smaller bowl, mix together the egg yolk and sour cream or heavy cream. Pour into the dry ingredients and mix into a sticky dough. If your dough is too dry and crumbly, add milk 1 tablespoon at a time until it's a shape-able dough. Add the roasted peaches and mix evenly through the dough. Sprinkle additional gluten-free flour onto a board or parchment paper and pour the dough out onto the floured surface. Shape the dough into a thick circle or a really large biscuit. Using a sharp knife, cut the dough into 4 scones. Place the 4 scones onto a greased or parchment lined baking sheet. Sprinkle the scones with the additional sugar, if you have large grained natural cane sugar all the better, but plain sugar is fine too. Bake for 12-14 minutes until golden brown and eat warm :-) Enjoy!